Twitter only has a favourite button but no dislike button. Hence we cannot see how many people dislike Trump's tweets. So now we add that button for you! 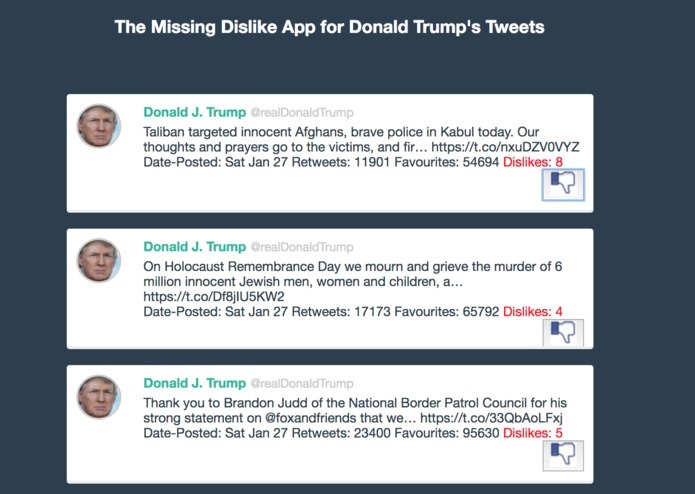 We show Trump's latest tweets and add a dislike button for them. You can now dislike his posts and everyone can dislike his posts together! Now we can see how many people dislike his tweets! Using reactjs, nodejs and twitterapi for node. We used legacy reactjs code which gave us a lot of errors and weird problems. Could not get the hosting done in time and also the user authentication due to the use of legacy code. Using the twitter api to query Trump's tweets and adding a dislike button for the number of dislikes to change visually. Always use the latests version of the technlogy, reactjs cannot be learnt in 1 day. Plan well and have more manpower would have been better. User authentication and hosting of app for all to use!